What’s the verdict: 10 years since Iron Man hit box office pay dirt with a blend of trademark spectacle and snark, the Marvel Cinematic Universe reaches Pt.1 of its Phase Three endgame. Just that Ant-Man sequel and Captain Marvel to go, then it’s part two of this adventure. 18 films in a decade have been required to bring us to this point, begun with Iron Man and topped off with Black Panther. Those movies’ box office roughly totalled 15-billion-dollars worldwide. Fair to say there was always going to be an army of popcorn munchers clambering to enlist in this conflict. And Infinity War’s $640m in four days proves the studio is not losing its Midas touch soon. On the road to Infinity War there have been miracles. Iron Man, Captain America and Thor have proven themselves cinematic equals to Batman, Superman and Spider-Man. Spidey himself was rescued from Sony and given a Homecoming (Tom Holland’s pitch perfect Peter Parker is one of Infinity War’s standouts). Daredevil and The Punisher were finally done right (on the small screen). It only took a mere ten years to get the bean counters to greenlight a black cast led superhero movie. Why then, despite the boffo box office, is Avengers: Infinity War a disappointment? The not-hard-to-guess answer is because for all the MCU’s ambition, treating movies as episodic TV robs instalments of individual spark. Embalmed in rigid formula and favouring multi-movie plot arcs above character and emotion mean the final product is merely that, a product. Slickly produced, often fun to watch, but ironically failing to soar. Infinity War also forgets what makes a decent Avengers movie; actually having the Avengers assemble. A plot that splits the team into separate groups may allow for ambitious planet-hopping, but at the expense of the drama you crave. Little of Captain America: Civil War (a better Avengers movie than this) is resolved here. One group if off on a galactic quest to stop an infinity stone reaching Thanos. Another faction is earthbound with stone troubles of their own. While a third is searching for a way to bring down the 10ft purple meanie. Points for trying to do something different with the gang, but this is one time you wish they’d have stuck to the tried and tested formula of having the team work together. Plus, with the Guardians of the Galaxy being spread around, enjoyment levels are directly linked to opinions of that franchise. For the record, this reviewer wishes they’d guard a galaxy far, far away. Compounding this is the generous time Infinity War affords Thanos. Marvel’s difficulties creating a villain as compelling as their heroes now seems almost part of the house style. But, it dramatically hobbles the adventure here, despite Josh Brolin’s valiant mo-capping. Mr. T’s motivation (kill half the universe to save it from itself) is promising, but bogged down in uninteresting dialogue and inert scenes of Thanos’ generational squabbling with adopted daughter Gamora (Saldana). Surprising given that screenwriters Christopher Markus and Stephen McFeely penned Civil War and Captain America: The Winter Soldier, the one five-star movie in the MCU. Heroes do stupid things for emotional reasons unearned and unconvincing. The promised Big Dramatic Shocks are both big and dramatic, but impossible for the franchise to commit to so again dramatically empty. Although a surprise at the top of the movie does seem permanent. It’s not all doom and gloom. The Russo Brothers (also behind Civil War and Winter Soldier) can do to-die-for action and Infinity War fizzes in its fisticuffs. An Edinburgh based skirmish with Thanos cronies and Captain America’s crew crackles with well-choreographed superhero mayhem, as does an earlier NYC encounter. The Marvel repertory players acquit themselves well. Downey Jr, Evans and Hemsworth are nearing end-of-contract status but none of them phone it in. 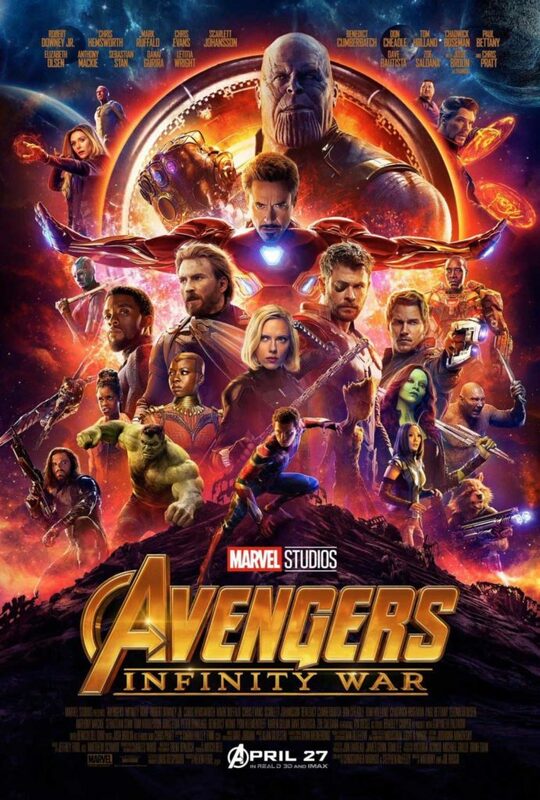 And there is something quite impressive about having Mark Ruffalo, Chadwick Boseman, Paul Bettany, Elizabeth Olsen, Danai Gurira, Chris Pratt, Don Cheadle, Benedict Cumberbatch, Tom Hiddleston, Peter Dinklage (in a nice bit of stunt casting) and Karen Gillan all appear in one movie. The action-packed finale, on two different planets no less, delivers blockbuster thrills aplenty. Thor’s arrival into the climactic action should haunt many a “spine-tingling moments of 2018” lists. As should the post-credit sting. Ultimately though, after ten years Avengers: Infinity War should have a stand-up and punch-the-air moment. Something akin to Spider-Man in Civil War if it wasn’t ruined by the trailer. Alas, no such moment arrives. Meaning Pt.2 has planet-sized heavy lifting to do.